We often hear in India the phrase “I have full faith in the judiciary” and that “the law will take its own course”. I do not use these phrases and I have little faith in the judicial system. The law almost never takes its own course in India. The state is always up to mischief against the citizen and the judiciary usually does not resist it. Let me illustrate this by looking at the case about which we are hearing so much these days, the arrest of five individuals whom this government, and its media, are calling “urban Naxals”. I will urge readers to withhold their opinion about these individuals, particularly based on what they are hearing and reading in the media. It is nonsense. The individuals should not have been arrested and in any civilised democracy (which India is not) this would not have happened because civilised democracies have functioning judiciaries that protect the rights of citizens. They are not enthusiastic about rubber-stamping whatever the state produces before them that violates our rights. I accept that in the current instance it is also the judiciary itself that has revealed the problems within it. I do not mean the Supreme Court, but Delhi high court. A two-judge bench was looking at the arrest and transit remand of one of the five individuals, Gautam Navlakha. This court’s order on the matter, dictated by Justice S. Muralidhar, is a remarkable document and must be read by all citizens. It is 10 pages of clarity, precision and elegance. 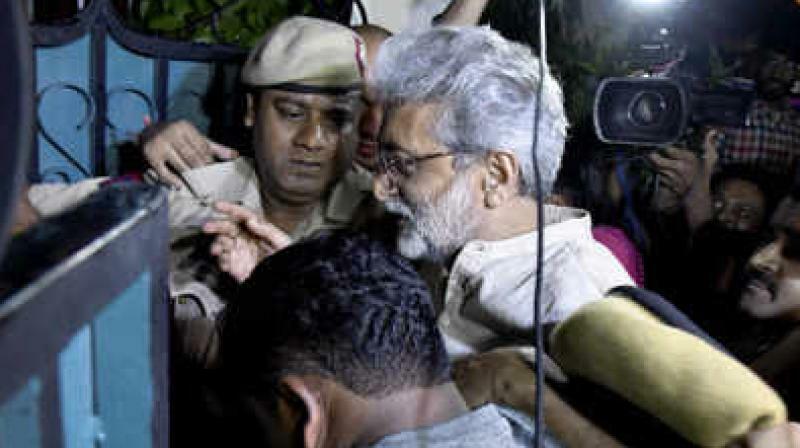 On August 28, Gautam Navlakha was arrested from Delhi. The police did not have a search warrant and were not allowed to enter his house. They went back and returned with a warrant. The basis of the case was an FIR filed about an event held on December 31, 2017. Gautam was not named in that FIR. He says he was not even present at the meeting. The charge of Unlawful Activities Prevention Act (which is the law the government uses against terrorism) was not originally mentioned in the original FIR. It only had sections related to promoting disharmony. After his arrest, Gautam had to be taken to Pune. The chief metropolitan magistrate (CMM) of Saket in Delhi, Manish Khurana, allowed transit remand to take him to Pune. The transit remand application was made in Hindi. However, the documents that were produced before the magistrate were mostly in Marathi. The Delhi high court said: “It is not possible to make out from these documents what precisely the case against the petitioner is.” The question we as citizens should ask is: then why was permission for the transit remand given by the magistrate? The high court ordered that the case would be heard the following day, and that the documents that were shown to the magistrate should be translated from Marathi. Meanwhile, Gautam was to be taken back to the place where the police had picked him up from. In the morning, the advocate for the police said that the translation was taking more time and the court gave till afternoon. At 2.15 pm, the court was shown a few pages, including the FIR translated into English but with much of the material still in Marathi. The police lawyer asked for still more time, which the court did not give. It was at this stage, on the 29th, that the police lawyer said that the Supreme Court had intervened. The high court then said it would no longer be appropriate for it to continue hearing about the validity of the transit remand.